The gist of the episode: Sure, markets generally work well. But for some transactions — like school admissions and organ transplants — money alone can’t solve the problem. That’s when you need a market-design wizard like Al Roth. Al Roth, an engineer by training, is a professor of economics at Stanford and won a Nobel in economics in 2012. 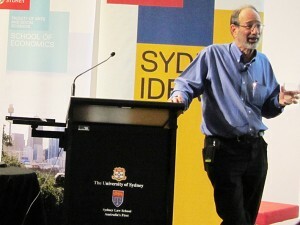 (Roth shared the prize with Lloyd Shapley, whose research influenced Roth). What kind of work did Roth do to land the Nobel? It’s not the kind of thing that typically wins a Nobel. Roth has helped people who need a kidney transplant find a donor. He’s helped new doctors find their first jobs. He’s helped high-school students in New York City find the right high school – even though Roth himself, who grew up in New York City, dropped out of high school. ROTH: Matching markets are markets where money, prices don’t do all the work. And some of the markets I’ve studied, we don’t let prices do any of the work. And I like to think of matching markets as markets where you can’t just choose what you want even if you can afford it — you also have to be chosen. So job markets are like that; getting into college is like that. Those things cost money, but money doesn’t decide who gets into Stanford. Stanford doesn’t raise the tuition until supply equals demand and just enough freshmen want to come to fill the seats. Stanford is expensive but it’s cheap enough that a lot of people would like to come to Stanford, and so Stanford has this whole other set of market institutions. Applications and admissions and you can’t just come to Stanford, you have to be admitted. LEISHMAN: It’s saving a lot of lives. We have about 600 kidney-paired donation transplants a year right now in the United States. In 2000, we had 2. … We would have stayed doing 2 or 4 or 6 a year without the algorithm. The next time you hear someone say that economists are a bunch of selfish good-for-nothings, feel free to counter by telling them about the fine work of Al Roth.